Ten weeks out now, though it feels like much longer, as apart from our family and friends we aren't missing much from our previous existence. Life afloat is full of interest and variety with the compensation of sunshine virtually every day, though since reaching Andalucia, it has been just a little too warm. Re-capping, we left the Hamble river on Mon 5th July and crossed to Alderney in the Channel Islands next day. The next leg, a four day passage, took us across the Bay of Biscay direct to La Coruna on the Northwest coast of Spain. There we began a slow cruise down the Galician coast, calling in at all the Rias (huge flooded valleys). They are all charming, with wooded hillsides strewn with large granite outcrops. The culture is rich, the people are warm and friendly and most important, the seafood superb. We fell in love with the Ilas Cies (Islands of God) which straddle the entrance to the Ria de Vigo. They have steep rocky hillsides, covered in forests of pine and eucalyptus and of course extensive beaches of coarse white sand. The charming city of Bayona and incomparable seafood of the little town of La Guardia took us to the border of Portugal. Since then we have hopped from port to port, seeking shelter from the Atlantic swell. 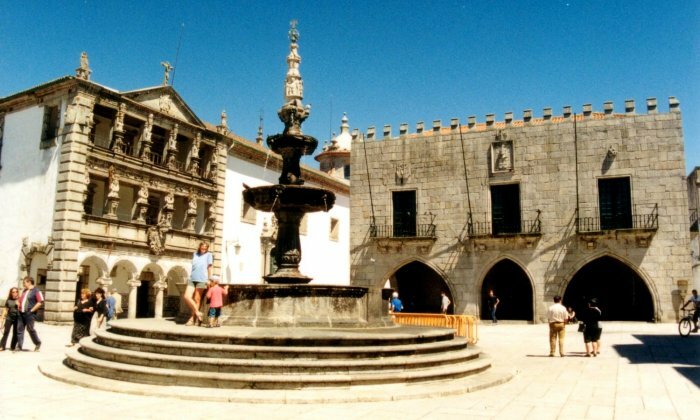 Most were busy fishing towns but many such as Viana do Castelo were rich in architectural and cultural heritage based on past trading activities. Outstanding on this leg were the two principal cities of Oporto and the capital, Lisboa. They were crowded busy and hot but with vitality and masses of things to see and do. In Oporto we visited the homes of some of the Port exporters to learn about the wine and of course carry out some comparative tastings. Lisboa is full of museums, galleries and places worthy of a visit. The city is overlooked by the impressive Castelo de Sao Jorge which it was difficult to drag oneself away from. Almost all these attractions are free in Portugal which makes a change from the UK with it's man on the gate. As we move south the natural fauna changes. Gone are the traditional seagulls, replaced by elegant Cory's shearwaters which soar effortlessly around the boat. We have experienced endless 'dolphin encounters'. The most memorable being a school of around forty that came to kiss the bow of the boat in 'fin to fin' groups of up to ten. We have also seen schools of smaller dolphins that specialise in jumping ten or more metres above the water. Lesser jumpers are the flying fish. They leap together in their hundreds and can be mistaken for sea birds until you get used to them. A major turning point was Cape St Vincent. North of there the weather is typically that of the northern European Atlantic coast with strongish winds and significant swell. To the south it gets much warmer and the swell disappears. Here we are, rounding Cape St Vincent on Sunday 5th Sept and experiencing that sudden change over a span of just a few miles. An hour after this picture was taken we were snugly at anchor in Sagres. North of the Cape, anchoring off would have been much more risky. This point also marks the start of the Algarve. 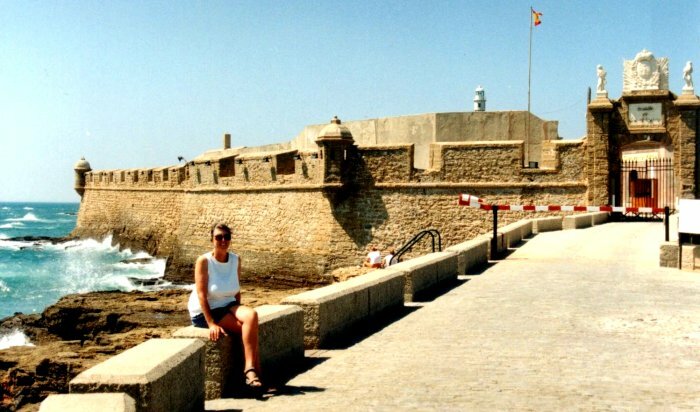 We had experienced some of this in '97 on the way back with Amoenitas, so wanted to get on to explore Cadiz which looked interesting. This proved to be a superb stop over. The old town is little changed, being arranged in tight, regular matrix with streets of 4m (13ft) wide between the four or five storey blocks. This made for shady walking but an horrendous traffic problem. When a vehicle stops, for whatever reason, the whole street is blocked and the pollution is noxious. This makes small scooters a popular alternative to a car but they bring acoustic chaos. Nevertherless Cadiz was a high point of the trip and we loved exploring, map firmly in hand, uncovering some of the superb squares and parks. Here it is one of the major defensive coastal forts. We arrived in Cadiz in good time to get to Gibraltar, some 75 miles away, where we planned to meet old friends, Dave and Pat Bond, from Romsey who were there for a four hour stop over on the Orianna. Unfortunately, as we reached Cadiz a Levanter set in. This is a gale force easterly that blows in the Strait. We saw a lot more of Cadiz as a result and ended up battling against the seas into Gib. With the help of a taxi, we got to the Orianna with just ten minutes to spare. Here we all are at the Old Rock pub reminiscing (and recovering). 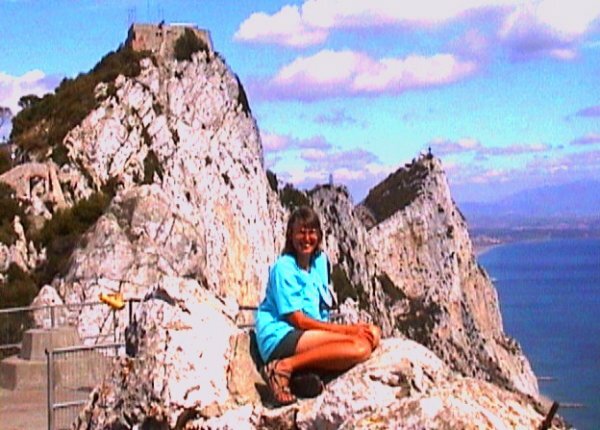 Gibraltar is an important re-victualling and re-fueling stop. We stock up here for the Atlantic crossing and for living in the Caribbean where many things are difficult to find as well as extremely expensive. One major planned purchase has been a digital camcorder (Sony DCR-TRV10E) which will enable us to send videos back and take digital still photographs for direct transfer into the computer. In Cadiz we also managed to sell our boat TV and video which work in Spain and nowhere else we are going. Now we have a new 14" one, bought in Gib. However, shoe horning it into the shelf required mods to the boat and sawing off the back of the TV. Of course one has to go up the Rock again, so here is our first attempt at direct digital picture production, as an alternative to getting the 'wet' film processed and scanning it in from a print. The next leg is 600 nautical miles out into the Atlantic to Madeira. There we hope to meet neighbours Roger and Barbara Ravenscroft and some old friends we made way back in our Yorkshire days, Doug and Margaret Emmott. We are also hoping our older son Bruce and girlfriend Tracey can find time to get out to see us there. From there it is another 250 miles to the Canaries where we aim to be around the 19th October. Di's Mum will join us there. for two weeks. We will leave to cross the Atlantic to St Lucia on about the 20th November. Jim Gill, a close sailing friend of over twenty years hopes to escape work for long enough to join us for the crossing. We should be downing our first rum in the Caribbean around the 14th December, in good time to greet Jim's better half, Liz who is coming for the millennium bash.